"Duuuuuude!! I have no idea what happened tonight but I wish you could have seen it! I was on fire!! That reverse deep half sweep is getting to be my bread and butter and my side control is getting loads better! These sessions of ours are helping me so much! Even some of the lads have commented. Thank you ever so much bro :) - this is helping me in a lot more than just my jits and I appreciate the hell out of it!" "Caught that collar X-choke from guard rolling tonight :-)"
"Hi Liam, Just a quick text to say I DID IT! I tapped somebody out for the first time. I've forgotten the name of the technique (I was in mount, submission was by the armlock/paintbrush type movement...) but it was awesome and I'm chuffed. All the little tips you taught me worked perfectly. Cheers mate - it was all down to your teaching!" "Hey man thanks for the private session last night. Got a sweet triangle from guard this morning on a physically strong blue belt - went exactly as you showed me. Constant hip pulling, pushing away his base and kept pulling down so he's having a nightmare in my closed guard, not being able to comfortably posture. After a minute and a bit of this pressure he gave me the space to get my leg over, then I rolled him on to his side and took the time to work it and secure the sub! Thank you so much!!" On Stage! How awesome is this picture!! "I've known Liam since 2005 and while it's hard to write about your friends some things jump out. He's very dedicated and always has a big smile on his face. His enthusiasm as a coach and depth of knowledge of teaching and coaching methods meant he was the best person to design the "gi", "nogi" and "introduction to grappling" curricula we use here at Fighting Fit. He's always been reliable, friendly and professional and I can't think of any reason why anyone wouldn't benefit from training with him." "Liam is an intelligent and hard working guy with a great heart. He has a burning desire to improve as a martial artist as well as in all areas of his life and I applaud him for that. His blog is sensible and informative and is the product of much hard work." 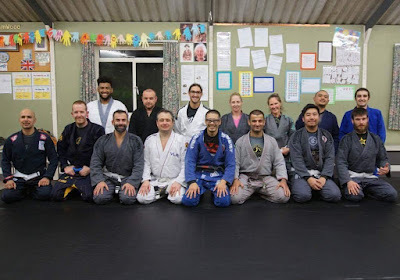 "After attending a couple of fundamental BJJ classes at Fighting Fit (I'm a complete newbie) I discovered a few key things. Firstly that I actually liked BJJ, secondly it was just as challenging to learn as I thought it would be and finally that Liam didn't just love teaching jujitsu but was also a really nice and genuine guy. I struggle sometime to make classes due to work so I took my limited knowledge, a deep breath and booked a private lesson. Although I wasn't totally sure what I'd let myself in for I can honestly say that I didn't regret it for a second! The session was totally paced around my needs and abilities so I never felt awkward, uncomfortable or out of my depth. The hour absolutely flew by and I felt that we had covered so much content. Even better was that Liam had managed to quickly get me linking movements together so that I got that sense of achievement that you only get when you when have that cool realisation your actually doing it! At the end of the session I had fallen in love with Jiu Jitsu just that little bit more. I totally recommend anyone thinking about doing a private lesson to just do it!" "When I first spoke to Liam about private BJJ lessons he set up a meeting with me, in which he went through exactly what I wanted and what he could offer me. From this Liam put together a three-stage plan for me, which would take into consideration the small bit of experience I already had in BJJ and to also aim towards getting me towards competition level. I found this plan extremely useful and very helpful in my development. One thing I really like about Liam as a teacher is I find I can ask questions very easily, even if he's gone over the position or transition before.... Something which put me at ease and made learning a lot easier. I have found my progress has come on brilliant under Liam and not only have I gained a very good teacher but friend as well. I would recommend him to anyone looking into learning BJJ and at any level." "I have just completed Liam’s Intro package and for all part-time grapplers out there (and full time ones) it is definitely of benefit! Liam breaks things down into manageable chunks, each concept leading onto the next. BJJ for me is a hobby, and one I cannot participate in every week, so it is critical for me to have a path to escape! Liam’s course gives me that path. Now when I find myself in and inferior position, I am thinking BSC, APE. Liam is a great teacher and, all part time grapplers out there can benefit from what he teaches!" "Approachable and friendly, Liam is a knowledgeable grappler who was more than happy to answer all my questions, and was apparently delighted to go over the key concepts of a position again and again until I felt I understood them. He radiates enthusiasm for the sport of jiu jitsu, and seems to genuinely enjoy the process of teaching and imparting knowledge. I did Liam's "introduction to grappling" course as a white belt and took further privates as a blue belt, and if you are looking to shore-up and improve your fundamentals it is difficult to imagine a more worthwhile thing to spend your money on. Unless you are homeless and destitute, of course, in which case you're probably better off buying some food. Liam can also submit the weak-minded with a mere thought, although this is a skill which evidently requires more than three hour-long sessions to master." Unfortunately at high school here you're lucky to find a teacher with one of those things. However, when it come to BJJ, Liam has both and he has, somehow, I don't know how but just somehow made a sport of chokes, locks, and pain incredibly fun!" "I decided to ask Liam for a couple of private lessons to help reinforce some basics before my first competition. I have been training under Liam for just over a year, I have always found him to be a very approachable, passionate and knowledgeable BJJ teacher. The private lesson was everything I could have hoped for; Liam and I prearranged a game-plan to suit the gaps in my knowledge, we covered everything I wanted to know in great detail - plus some extra super-secret techniques which I have since been putting to good use. Liam was his usual patient, accommodating self - there was plenty of opportunity to ask questions and cover details which are impractical in the usual group classes. I wouldn't hesitate to recommend Liam to any other aspiring BJJ practitioner." "The first thing Liam did was to meet and discuss what it was I actual want from my journey into BJJ. I studied Wing Chun as a kid and was originally going back to my Sifu but found things had changed in a way I didn’t like, so I started to look at what else was out there. Liam actually lives this. He has genuine passion for the art and for teaching it and this makes it very easy to learn with him. Even if I ask him a daft question it’s dealt with in a professional manor. And not only does he teach the physical art, he teaches the philosophy behind the art so you get a mind and body education. For anyone wanting to learn BJJ I cannot recommend Liam enough not only will you grapple physically but mentally to help you get a balanced view of the art. "The day after a NoGi tournament I decided that I needed to give myself one giant kick up the arse and get my grappling skills to a new level, I knew that the way to do it was having some private sessions with Liam. As I didn't really know where the holes in my game were, I asked Liam for his opinion on where he felt that I needed work. Liam then suggested his "Introduction to Grappling" course. Using his patented (well not really, but you get the idea) easy-going attitude and his pure love of what he was teaching we set about his "Introduction to Grappling" course, which re-covered the basics which I already (should) know with a fine tooth-comb and then did more advanced techniques that I didn't know.... Thus producing an ARMBAR MONSTER! If you are looking to start grappling or if you just need a kick-start to your game I would implore you to go and see Liam, if you don't you may need to get your head examined! If your lucky he might just help with that too!" "I have thoroughly enjoyed the Introduction to Grappling (I2G) course. I personally decided to attend the course as this side of my game is at a very beginner level and thought by doing a course which starts from the basics and builds you up would be the best way to learn and that's been the case. When I paid for the I2G course at Fighting Fit-Manchester I knew I would miss two of the classes for certain due to a holiday but still thought it was worth doing, but didn't realise it would still be a bargain 2 classes-less or not. The quality of the teaching is very good and the best part is the pace of the class. You're always given enough time to practice each technique while still cramming a lot of different techniques into the lesson, each time you come away feeling you have learnt a lot. I would recommend to anybody wanting to start Brazilian Jiu Jitsu as an individual sport or for their all round MMA game. 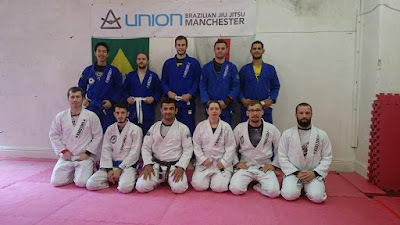 "I had never done any BJJ/Grappling when I started the Introduction to Grappling (I2G) course at Fighting Fit-Manchester but Liam and Martyn are great teachers. They break every concept down so you know exactly what you need to do, they answer all your question good or bad ones I may have, basically they are two great guys with loads of knowledge and experience and anyone wishing to start BJJ/Grappling should speak to these two guys." 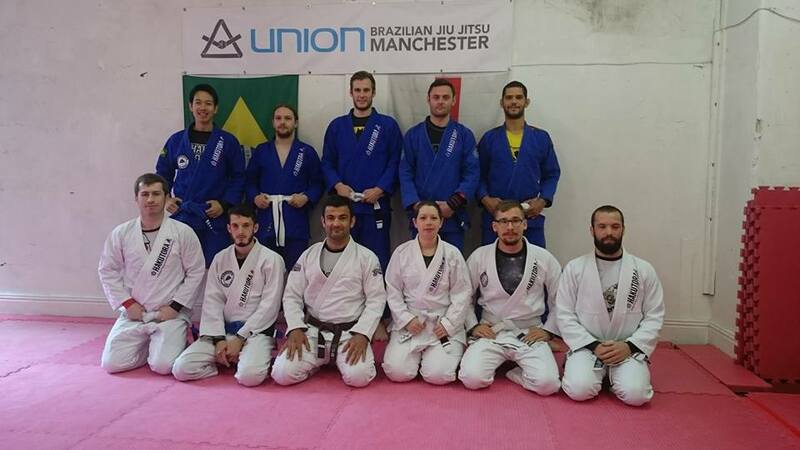 "I originally signed up for the Introduction to Grappling (I2G) course at Fighting Fit-Manchester as 2 of my work colleagues have been studying BJJ for approx a year and have been enjoying it immensely. I was after something that would get me to grips with the basics and also see if I enjoyed BJJ before going out and investing in all the equipment. 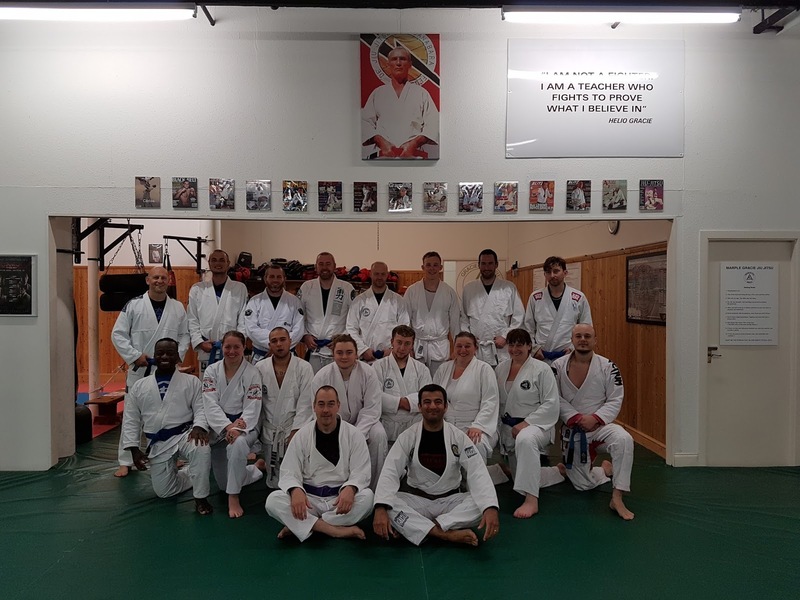 The course being £40 for 8 weeks including Gi hire seemed really good value as well as the fact the course was limited at 8 people meant there should be enough time to recap and ask questions on anything I did not understand. I was a little apprehensive before the 1st lesson, but this was soon put to one side, as Liam and Martyn put everyone at ease. Liam is a very good teacher and will go through moves at an ideal pace for the “beginners” like myself. Martyn is equally as good and the pair are always on hand to offer hints, tips and advice as to how to make a move better. I would happily recommend this course to anyone that is thinking of seeing what BJJ is like. I found the Introduction to Grappling (I2G) course enjoyable and rewarding. The teachers were knowledgeable and able to explain techniques in both an MMA and BJJ context. The lessons progressed at a suitable pace with a good deal of repetition which allowed the techniques to be committed to memory. Furthermore, Liam and Martyn were patient and willing to answer any questions. On a final note, the atmosphere at Fighting Fit Manchester is friendly and welcoming and I'd highly recommend you come along. I started in the fundamentals class some time ago and then enrolled on the Introduction to Grappling (I2G) course with Liam and Martyn. They both have a great way of teaching which makes a very technical martial art relatively easy to pick up. They are approachable and friendly and the atmosphere in the classes and in the gym generally is not only warm but conducive to quick learning. Following the course and having rolled for about 6 months I was coming up to my first competition and so taking a bit more time to get on the mat. After rolling with Liam in a nogi session I emailed him to see if he had any tips. Straight away he kindly suggested a few things to focus and work on over the coming months. That was free advice and there was no discussion of a private lesson at that stage. That's just testament to how approachable and friendly the man is! Wanting to work on his advice quickly though and knowing that he offered private tuition I thought I'd invest in some one-to-one sessions. Liam was able to accommodate me at the first time of asking. We organised a meeting before the open mat session that Friday and although it was scheduled to run for an hour Liam's enthusiasm for what he was teaching and his eagerness to convey the message and ensure I understood meant that I ended up receiving an extra 20-30 minutes or so free tuition. The session was well structured and Liam clearly came to the gym with a plan as to how we would progress through our time on the mat. He broke everything down into easily manageable sections which were explained fully and then demonstrated, giving me an opportunity to ask for clarification if needed. The detail he went into was not only impressive but related in such a way that I understood immediately what I was supposed to be doing or aiming for. There were a couple of Eureka moments for me when I recognised something I'd either been doing wrong or a way of doing things correctly that had previously eluded me. Also, with every movement or manoeuvre, he explained how it was applicable in different situations (nogi / gi) or positions (mount / side-control etc). In sum, Liam is a great teacher. The sessions are enjoyable, informative and helped me pick up moves I'd only been victim to previously. In fact, such was the quality of the teaching that I immediately went into the open mat session and used some of what I'd just learned to great effect. I will definitely be utilising Liam's teaching services again and would recommend him to others! "I've rolled for just over a year now and after hearing numerous Jiu Jitsu players that I respect (Joe Rogan, Martyn Cahill and a few others) stress how important it is to have your fundamentals down, coupled with the fact that I find myself caught in the same ropey positions week after week - I thought it best to contact Liam. We had a 30 minute chat over a coffee and after the talk my instincts told me that this was an excellent idea (my first lesson confirmed this in spades!). Liam's method of teaching is superb - he encourages questions and is quick to identify the small adjustments that need to be made. I had also mentioned in our chat that I was a HUGE Eddie Bravo fan and Liam was kind enough to show me some Rubber Guard variations on the moves he was teaching me. Conclusion? An excellent instructor and a super cool guy. Stop reading this and get in touch with the guy - you won't be disappointed!" "Liam Wandi has a genuine grasp of Jiu Jitsu and knows how to deliver the finer details that drive this martial art. The way he structures his teaching is exactly the way I learn. My game has come along a treat since training under him." "I know you don't need my approval.... Good class last night- you broke each transition down in such an easy and understandable manner - you're a great coach"
"Liam clearly loves what he does and this shines through in his teaching. He will always understand what you're looking to gain from the session whilst picking up on weaknesses that need improvement. With detail being such an important part of BJJ, Liam takes care to ensure each tiny process is perfect so that chains of movement can work seamlessly. The best part is then taking it live with an opponent and being able to apply these techniques in a competitive situation"
"Having just started Brazillian ju jitsu in London I was recently in the North West for two weeks on a family visit. Looking for somewhere to continue my training I googled the various Manchester gyms and what initially drew me to the Fighting Fit Martial Arts Centre was Liam's teaching bio and subsequently checking out his great blog 'The Part Time Grappler'. Having time on my hands I decided to take three private lessons with Liam and can say without hesitation he is a fantastic teacher and I can't recommend him enough. Brazillian ju jitsu can seem overwhelmingly complicated at times yet Liam breaks down the techniques and principles in a way that is easy to understand, great fun and leaves you hungry to learn more. It's not always the case that great practitioners make great teachers yet Liam backs up first class teaching skills with his ability on the mat. Whenever I'm back in the North West I'll be signing up for more lessons - those of you based up here should make lessons with Liam a regular part of your training!" "I had shoulder surgery a couple of months ago, Jiu Jitsu had been out of the question and not rolling was killing me. That’s when I spoke to Liam. He was both aware of my injury and my frustration and went away to design a programme for me. We rolled on Friday in a private session and it was AWESOME. Not once did I feel my shoulder was in danger of further injury, he took a lot of time to make sure it was safe when we were rolling and made sure all the moves and positions were comfortable for me. He even checked up on me the next day to see if I had any soreness as a result etc. (I didn’t) what a Good Guy Greg. By far the best thing about the entire experience was forgetting I was even injured, he made one armed Jits feel completely natural and I felt like a badass old kung fu master with my right arm tucked inside my Gi (because using both hands would be too easy right). Cannot recommend Liam’s private lessons enough, fun, tailored to suit you and extremely rewarding"
"Repetition, they say, causes remembrance. Yet believe me I can often be the most forgetful person in the world, especially when it comes to the things of Brazilian Jiu Jitsu. With Liam Wandi however I feel things just seemed to click into place. You see, my ground game was always my weak area and whenever any MMA sessions went to the ground I would just switch off or tap-out to the same moves. I first met Liam through his group classes, and immediately felt that his style of teaching helped address my weaknesses on the ground. The way he broke a move down and then re-built it bit by bit allowed me to understand and grasp a discipline I once thought I would never conquer. So, in seeking to develop my ground game further I gave his one-on-one sessions a try. I must say I was not disappointed! The same teaching style I had come to enjoy in class was made all the more relevant as he broke down each individual technique. These he then built upon, highlighting certain nuances and subtleties he could not always fully address in group sessions. As the weeks progressed we drilled the moves and techniques over and over. This allowed me to develop an understanding of how each position can flow in and out of another. Repetition it seemed did cause remembrance! Now, almost two months in and as a result of Liam’s relaxed and approachable teaching style the confidence in my ground game is growing." "I first attended a class that Liam was covering and really liked his teaching style and friendliness. I approached Liam after the class to enquire about private sessions. He set up a meeting with me to discuss what I was wanting to achieve from the lessons. I had a background in wrestling but anything off my back was completely alien to me, I already feel way more comfortable off my back from the time I have spent training with Liam and I am looking forward to improving my jiu jitsu skills with him instructing me"
"About 75% of what I know about BJJ I learned from Liam Wandi. He has been an inspiration to me in the early stages of my Jiu Jitsu journey; from his fundamentals class for beginners, to the knowledge I’ve acquired from his excellent blog “The Part Time Grappler”, to my first private session, which was invaluable. In my private session I wanted to work on ways to improve my rolls with strong white belts. Liam was able to give me some specific techniques that will work in several likely positions, but also guide me in finding my own solutions to these situations by reinforcing some key concepts. The proof as they say, is in the pudding, and I have already been able to use my new knowledge on the mat, much to the annoyance of several opponents! On top of all this he’s a genuinely nice guy – never too busy to answer a dumb white belt question and never just going through the motions. His passion for both Jiu Jitsu and teaching are clear – you can see the buzz he gets when something “clicks” for a student. I’m sure Liam will remain a huge presence in my BJJ life as I develop, and I’m happy to recommend his services to anyone who wants to become a better grappler." "Liam! want to say a few words about our session together. Firstly I really enjoyed it! I also loved the structure of it, analysing my skillset, and matching that with what I wanted out of the session, then delivering it with a very elegant layered way, building skill upon skill with the drills. You clearly have a passion for teaching and a skill at it too. As someone who helps people reach peak performance states, I know a thing or two about skill acquisition, and your methods rock! I'd highly recommend you to anyone wanting to learn in an effortless and organic way. Part Time Grappler wins, flawless victory!" "Encouraging, friendly and above all, insanely knowledgeable is how I'd sum up Liam. I had my very first No-Gi BJJ fundamentals class with Liam very recently, and to be honest I was a little nervous. I'm barely a white belt as it is, so I wasn't entirely sure if I was ready or could handle what Liam had to throw at us at this particular session. From the very beginning, he carefully instructed us through the most basic movements, grips and positions, ensuring that we had the fundamentals locked in place. If at any point we had even the slightest bit of trouble or question about anything whatsoever, help was at hand immediately. I could really tell he enjoyed teaching! The session was one long logical progression from start to finish, with each step flowing from one into the other. By the end, I was able to go over everything we'd done in my head and understand the importance of every little nuance that we had learned. Things started to click! All in all, I got an awful lot out of the class and am really looking forward to the next one!" "Hey Liam, thanks for the private lessons in 'Intro No-gi'. 2 down and 2 to go, and they are great sessions. The techniques you shown me, I've added them to my arsenal now haha. Shame other white belts couldn't make these sessions as this could improve their game ah well. Anyways I would like to say your teaching methods are simple and understandable, which is great.......and in a friendly manner"
"Hello Liam, As I've told you, the last private lesson was a pleasure for me. But is not just about this private class only, in general I like to attend all your classes, you really know how to emphasis on every single important detail. You don't like to see people who didn't understand very well some specific techniques. You even spend some time after classes to answer people's questions about some specific positions. You prefer to stay a little bit longer with someone just to make him understand. You are truly a very good coach, I would recommend you to anyone, anytime, without any doubt. I hope I can train with you long enough. Cheers"
"I first met Liam at the start of the year. I was teaching full time in a high school and studying a masters degree and wanted to learn BJJ. I didn't think there was enough time in the day, until I stumbled on The Part-Time Grappler and saw that Liam was doing the same as I was...just doing it better. I emailed him and he replied within 15 minutes and invited me for a coffee. He treated me like a long lost brother rather than a complete stranger. 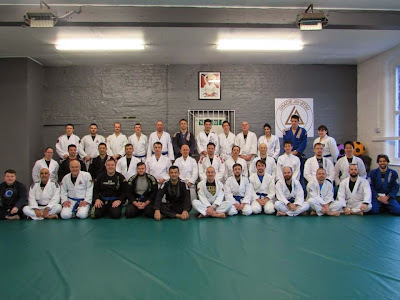 A few weeks later, I attended an Intro to Nogi session at Fighting Fit. The quality of Liam's teaching is superb and the best I witnessed at a Martial Arts facility. He focuses on concepts rather than 'copy me' and encourages students to use the techniques to develop their own style rather than force a style upon them. Progression is also key. Liam starts small and then shows how to build these fundamentals into more complicated techniques. I also love how he frequently revises what's been learnt already. Without this, I think I would have felt a bit lost. As it was, in my first hour of No-gi, I left with a smile on my face knowing I'd improved...I even managed to D'Arce choke the cat when I got home. Overall, Liam is an excellent coach. He breaks concepts down until they are easily understood, encourages ones own individual style and he is, thankfully, extremely patient. More impressive than all of this, however, is the man himself. Genuine, friendly and wise, spending an hour with Liam is worth the time even if Jiu-Jitsu isn't your cup of tea." 1- He has an open and friendly demeanour that puts the student at ease. 2- He has a relaxed yet methodical training style which allows the student to progress at their own pace and builds on their current abilities. 3- He has strong attention to detail and explains the reason why they are important. 4- He observes and correct the flaws in his students game in a constructive and positive manner. 5- Most importantly he truly cares about his students progress. I am very happy to say that my training session exceeded my expectations and I look forward to more opportunities to train with Liam! "Having been an armchair fan of BJJ and martial arts for a number of years I decided to take the plunge and head down to Fighting Fit Manchester for some BJJ classes about a year ago. Although it was massively enjoyable I struggled to keep regular sessions due to work commitments. I decided that the best bet for me to progress was to arrange some private lessons where I could get some step-by-step building blocks for my BJJ game, and Liam was the first person who came to mind. From the handful of sessions I attended, Liam stood out as approachable, patient, very(!) well informed, and had a passion for both teaching and BJJ which was apparent from day one. Having started my private lessons I can wholeheartedly confirm this. I think I had a smile on my face the whole of the first session - even when I was in an armbar! Liam is a fantastic teacher and you leave with new knowledge you feel that you can put to use right from hour 1!" "Liam’s passion for jiu jitsu is made clear through his teaching. I learned what felt like a disproportionate amount in my first private session and I am eager to learn more from future sessions and to apply what I’ve learnt when rolling with others. Liam is careful to provide small but significant details by breaking techniques into manageable chunks, before blending them to form an overview of a position or situation, enabling a more thorough understanding of the techniques learned. Recommend!" "I started my lesson with Liam as a complete beginner, and he quickly showed me some basic manoeuvres and got me confidently moving around. By the end I had learned an entire sequence of moves and Liam demonstrated some more advanced techniques. He has a real enthusiasm for the sport and I'm looking forward to continuing training with him in future." " Liam, I have started viewing Jiu Jitsu in a very different way since taking a couple of private lessons with you. A much calmer, more methodical, less frantic approach... and with a huge degree of optimism. For that I am very grateful and it was more than worth the money... but on top of that, I thoroughly enjoyed the time on the mat, your enthusiasm for the subject and the sprinkles of wisdom aside of it. I'm excited to continue the private classes to accompany my training at the gym. Thanks a lot." " I first met Liam a few months back when he taught a BJJ class at my martial arts school. Just from that lesson alone, I could tell that he held a passion for teaching and bringing the best out of his students. He was very approachable and patient which suits my style of learning. Being a white belt and wanting to improve as quickly as possible, I approached Liam for a private session. I must say it was an absolute pleasure to train with him, his teaching methods instantly drilled the techniques taught, into my muscle memory which I am confident of being able to use next time I roll. His knowledge is so deep, he was able to tweak techniques I had been struggling with by fractions to make a complete difference to them. Liam shows the passion in his teaching that he wants you to get the most out of your lesson, answering any questions I had. I feel with just one private lesson I have learned equivalent to a months training. I look forward to my next private and I am confident I will improve my BJJ at a fast pace under the tuition of Liam. 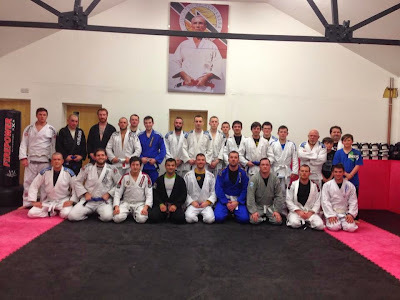 I would definitely recommend Liam to anyone wanting to improve their BJJ." 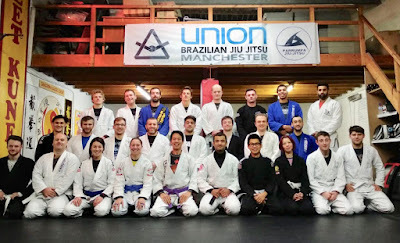 "I met Liam at Union BJJ in Manchester and he gave me some really cool tips in class so I booked in for a private lesson with him the following week. He's very generous with his time and a great teacher, he even gave me homework! I can't wait to roll in class next week and try out my new half guard escape!" "I'm a white belt and wanted a few private lessons to get myself really familiar with some basic BJJ. Liam teaches in a way that not only helps you remember techniques but also use them when fighting. I feel more confident after just 2 lessons. Liam is a great teacher and a lovely bloke!" "I had my first one to one with Liam not so long ago, as I was struggling with a few fundamental moves. I have to say it was an absolute pleasure and a great experience. Liam even took the time to find out why I started my journey in BJJ and discuss all of his experiences (which I have to say were mind blowing). I learnt so much in such a small space of time and can’t wait to put it into practice when I next roll. A great teacher, great guy, masses of knowledge and experience and I can imagine when I go back again and again, so many secrets to catch people out." "Liam's private session was really useful and gave me more confidence in my potential to progress in BJJ. Considering the technical nature of the moves, Liam made it really easy for me to put all elements into place and by the end of the session when we were rolling I felt like I could put defensive and offensive strategies into place much more intuitively. Being a teacher myself I know that to teach effectively is not an easy task, but Liam's expertise, communication, and attentiveness make him an excellent coach!" "Thank you very much Liam. I'll work on these guard passing techniques ASAP. I'm using the stuff I learned with you a lot now. It's easy to apply in multiple situations and they're good time-saving tips as its makes you struggle less so you can spend more time on the actual side control position and possible submissions than wrestling against their legs." "I had been to two or three BJJ fundamental sessions and knew I really enjoyed the sport but was pretty overwhelmed by all the intricacies and how everything pieced together. Liam got straight into assessing what level he was working with. What was really impressive is how he picked up one move i knew and an area (attack from mount) i had no idea about from just a few minutes rolling. He then seamlessly tailored a session to improve the first area and teach me where to go from mount. A properly personalised session! Aside from his BJJ Liam is also an incredibly nice and approachable person. I left not only with a greater understanding of what I had been trying to do in group classes but also having had a great time. Thanks!." "Liam is passionate about Jiu Jitsu and passionate about helping others develop their Jiu Jitsu game. He is an accomplished Jiu Jitsu practitioner and his teaching skills are exceptional. These credentials are exactly what I was seeking in a Jiu Jitsu coach and mentor. From our first lesson it was clear how much he can contribute to the development of my Jiu Jitsu. I am excited about the opportunity to work with him consistently to greatly accelerate my progress." "I have been training with Liam for approximately six months in a one-on-one capacity. As a relative beginner, Liam has quickly helped me become proficient in the gracie jiu jitsu fundamentals. Of even greater value to my learning, however, has been the layering of Liam's curriculum. Rather than just equip me with a toolbox of individual techniques, Liam has structured techniques together in a way which has enabled me to piece together a robust self-defence framework. Within this framework I have developed the ability to execute the fundamental techniques both in isolation and in combination. Liam's systematic approach has significantly accelerated my rate of progress and provided me with the ideal platform to explore more advanced techniques and combinations and begin to develop my own unique jiu jitsu game. I cannot recommend Liam's private classes highly enough. " I have finally found some time to sit down and write. It was great learning some basic details of Jiu Jitsu that were missing from my game. I now have a much better understanding of the positions and guard recovery has become much easier. I realised it when I was rolling today! It was great to get those details in my game. Looking forward to learning and adding more." "I have previously done a couple of seminars with Liam that were excellent so when I got the chance to take a private class with him I knew it would be worthwhile. Liam is an excellent teacher and really takes the time to get to know you and discuss the techniques you need to work on. We started my session with a light roll so he could assess my level, understand my game and identify any weaknesses. He breaks everything down and gradually adds more detail, making techniques very easy to understand and pick up. I'm really looking forward to putting the techniques I learnt into practice. If you get the opportunity I would definitely recommend training with Liam." 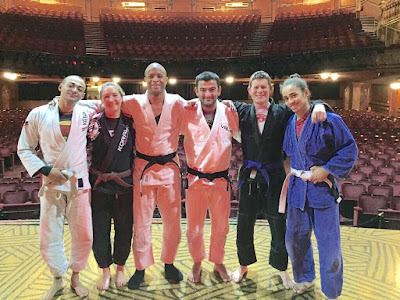 "'I went to Liam’s BJJ class in London while I was on a business trip. He was highly recommended by my BJJ friends in Manchester. I really enjoyed the session. The group was very friendly! Liam has been teaching us one technique from scratch: very very basic then he slowly incremented details Basic, + 1 detail, + 2 details, + 3 details…. And before I realised I was doing it properly with the fine details! I also liked very much the constant change of partner while still trying to apply that same technique. It helped me adjusting my positioning with different body shapes. We all struggle with that, don’t we? So thanks a lot Liam, It was a pleasure! I’ll definitely come back to your classes when I will be in London… I’ll bring my gi next time 😊' ." "'I recently started had a private class with Liam and in one hour we went through techniques both groundwork and stand up. As one of the few people I've trained with who try to follow a certain curriculum that balances between sport and self-defense, we started with the basics, working on escapes and I was really surprised that there was so much I was missing out on. For a class that is considered to be hardwork, Liam sure made it seem like fun ."